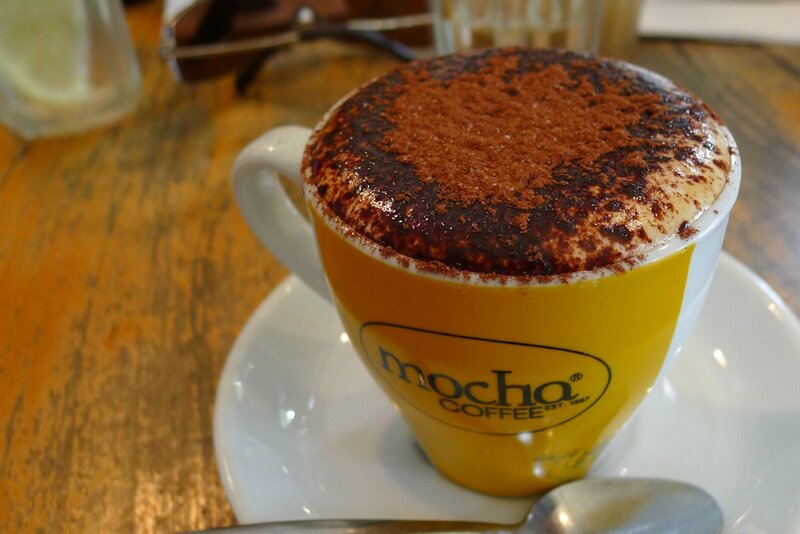 If you want to survive as a café on Crown Street in Surry Hills, you have to excel. Perhaps that is why we haven’t had a bad breakfast along this strip – there’s no room for mediocre. 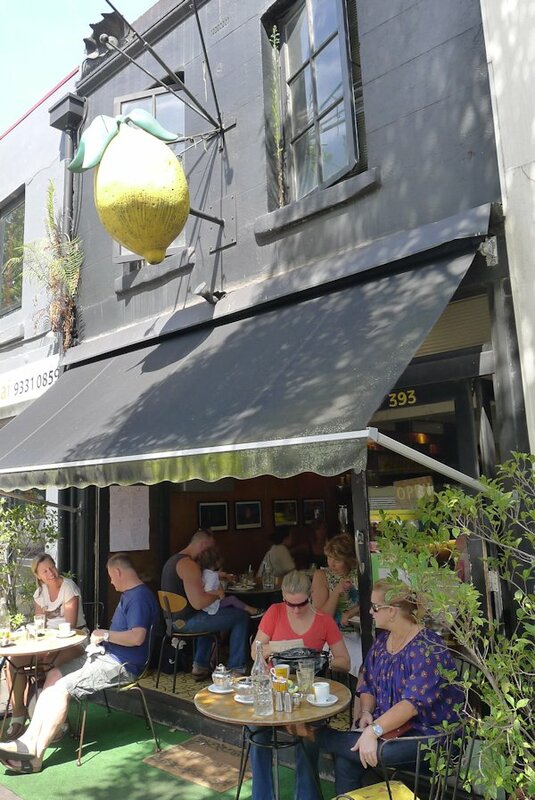 It’s hard to miss the always-buzzing café with the giant lemon outside. Often referred to as ‘Lemon Twist Café’ online, our receipt says Lemon Café so that’s what we’ll use. Although an overly-friendly dishevelled man asked us if we could see “the big orange” as we were taking shots! Space is quite limited at Lemon so be sure to arrive early. The couch with coffee table at the back seems to be one of the most comfortable spots if you can get it. 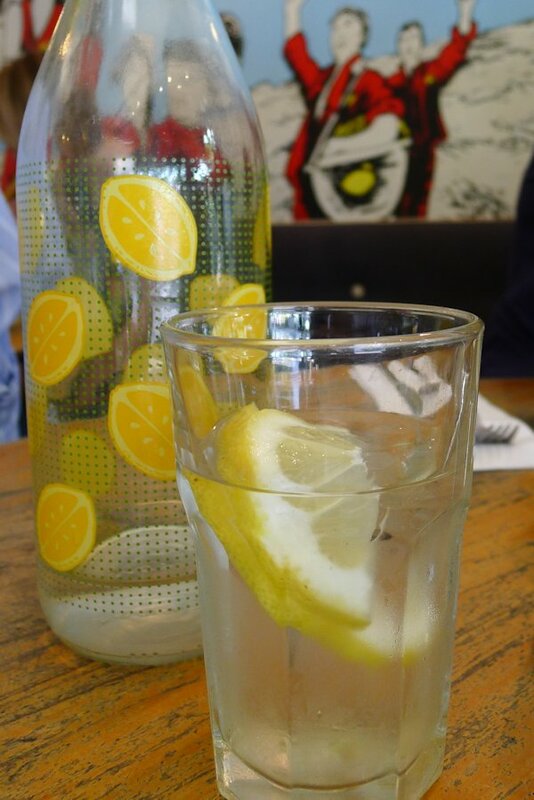 We were offered chilled water (with lemon) straight away and found the waitstaff to be extremely attentive and helpful. Most of the dishes on the menu have Italian names and the lunch menu features many varieties of pasta and risotto. But the reason you’re reading this is to learn about their breakfasts so let’s jump straight into the drinks. 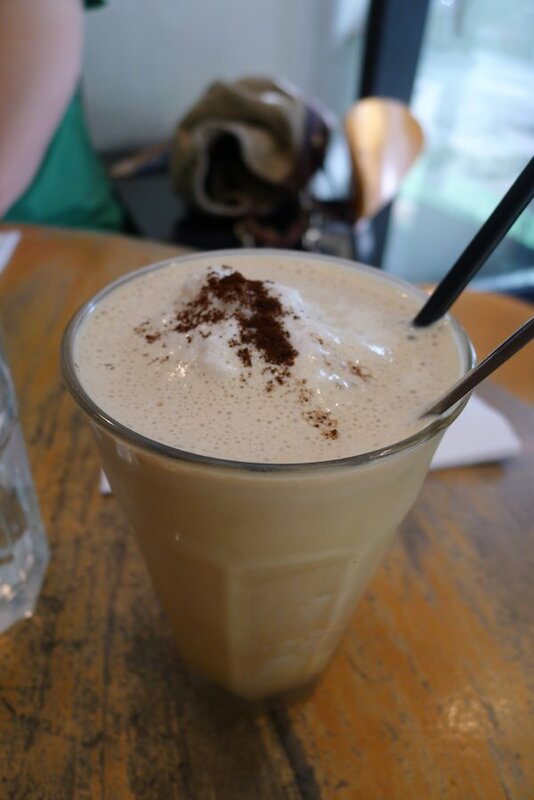 Iced coffee isn’t something that we order often but one of this week’s guests thoroughly enjoyed the frappe coffee ($6). In fact the entire table enjoyed it. Milk, ice cream and a powerful caffeine kick. The decidedly best beverage of the morning was the orange and mango crushie ($6). Slightly tart, sweet and with a hint of mango, it was very thirst quenching and refreshing. Lemon’s fresh fruit crushies are also available as pineapple, lemon & mint or watermelon & mixed berries. 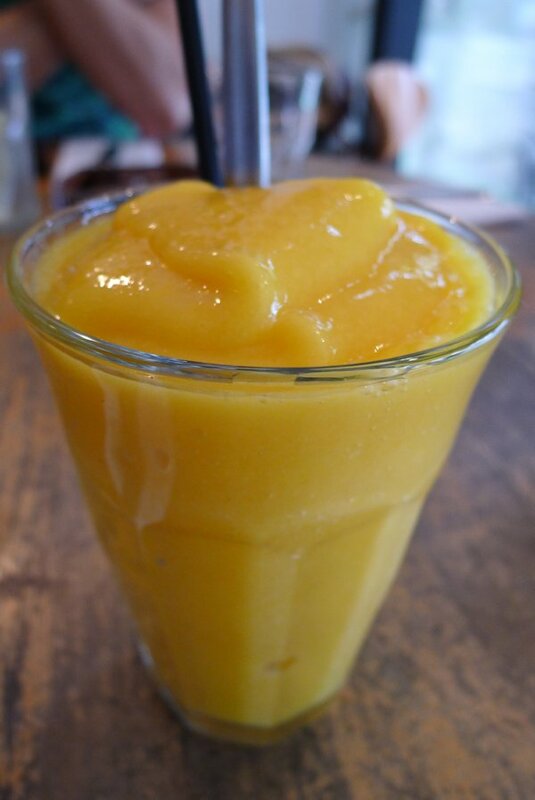 Fresh fruit juice ($6) and smoothies (mango, mixed berry or banana, $6) ensure that all cold fruid-based drinks are covered. Unfortunately the parade of fantastic drinks stopped with the cold ones. We found the coffees (regular $3.50, large $4) to be quite bitter. A large variety of tea ($3.50) is also available. Upon looking at the “breakfast” menu with bacon and egg roll and eggs with sides, we found ourselves thinking “is that it?” (we’re spoilt for choice visiting so many cafés, you see). Thankfully the “brunch” menu was on the next page which holds many Sydney favourites as well as some unique dishes. 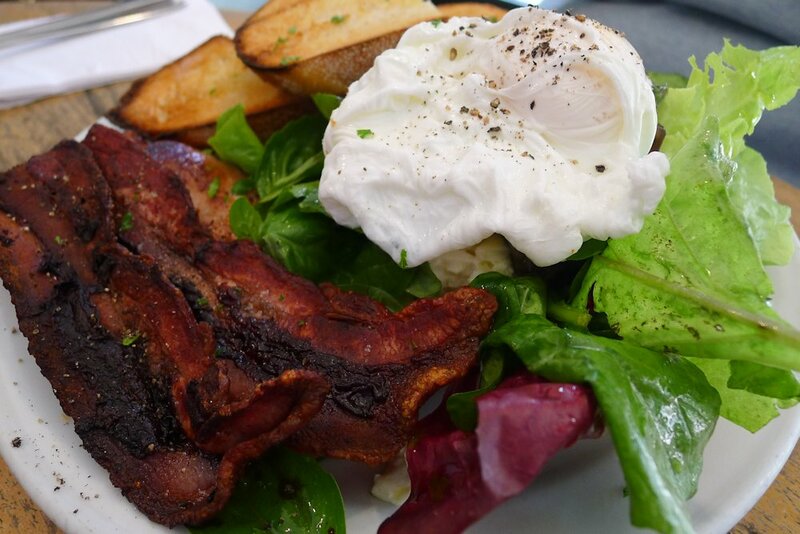 The buffalo eggs ($15.50) is a large but well-presented plate. We have to touch on the bacon first… crisp, thick and absolutely mouthwatering, it was one of the stars of the table! Nestled on the green leaves was grilled eggplant, buffalo mozzarella, cherry tomatoes and basil. This was all topped with two poached eggs. Pre-buttered and pre-cut hot sourdough on the side helped to tick all the boxes. There was no shortage of any of the promised ingredients and the flavours (which we wouldn’t have thought of combining) were matched well. 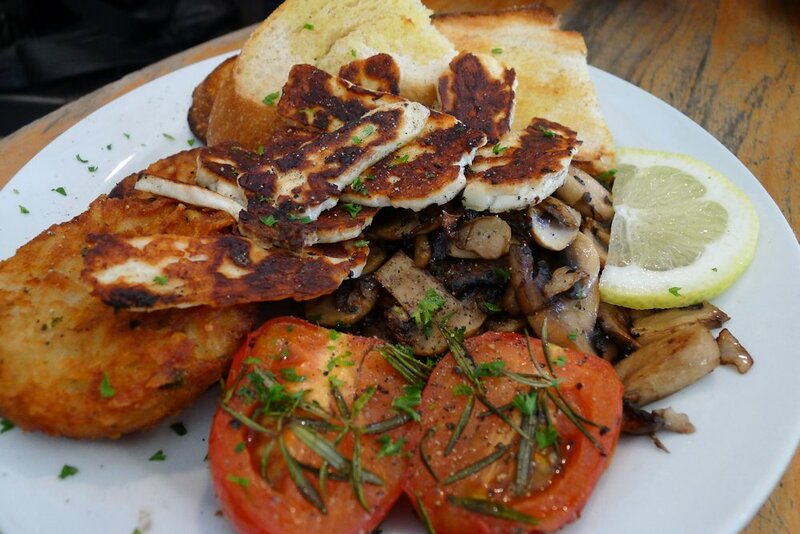 The haloumi breakfast ($15) was ordered with a side of hash browns ($3.90). Once again a very large serving which was well presented. This was a vegetarian’s delight featuring sautéed mushrooms and grilled haloumi. The tomatoes were roasted with rosemary and the hashbrowns were fluffy and quite light on the oil/frying. We certainly didn’t feel too guilty devouring them! 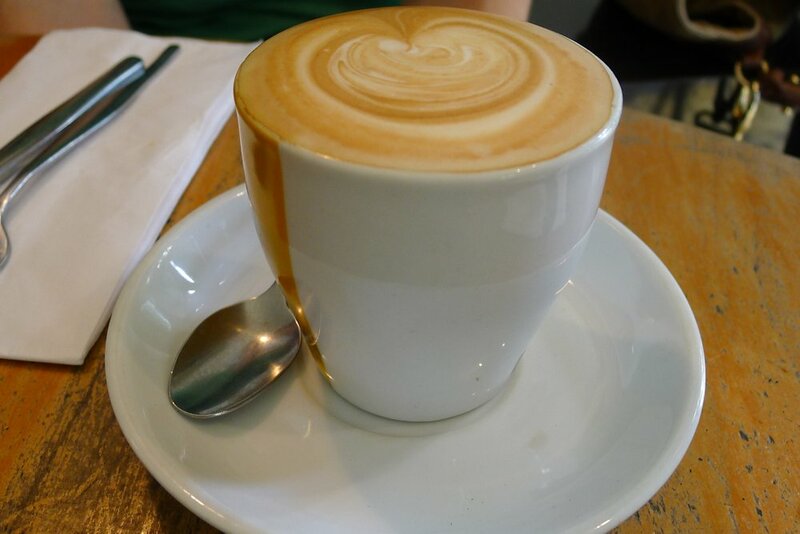 The bacon and egg roll costs $9.50 or $12.50 with a regular coffee or tea (save 50c) and is well worth the price. 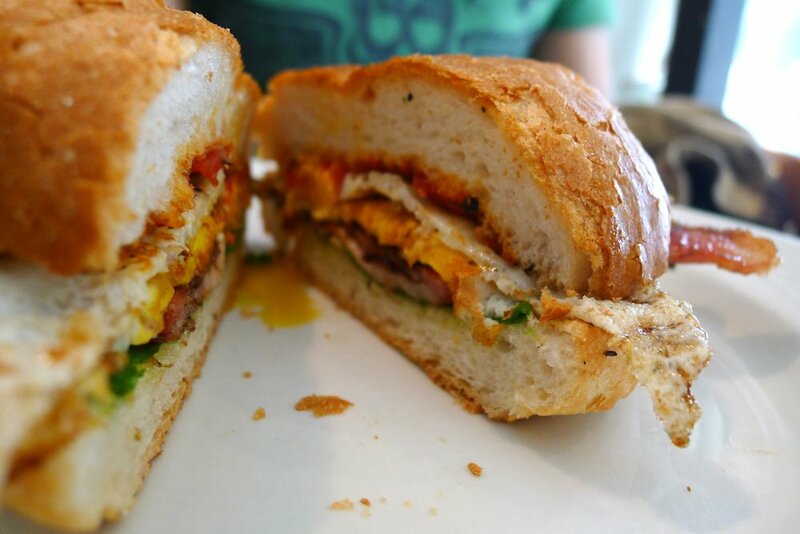 The roll was soft & airy and layered with rocket, fried egg, more of the delicious bacon and a tomato relish. The relish is claimed to be spicy and while it added some great flavours to the roll, we wouldn’t class it as very spicy. 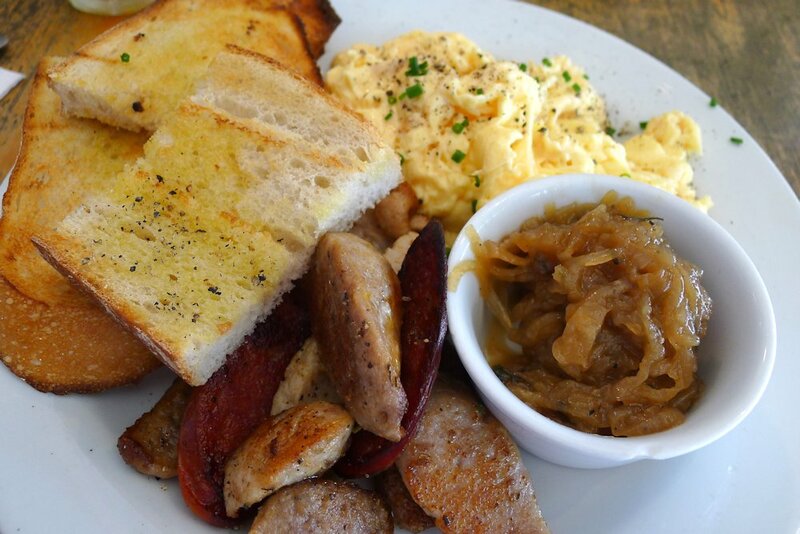 The salsiccia trio ($15) contains as the name suggests, three different sausages. They were chorizo, chicken and lamb and we are pleased to announce we have found another establishment with some great sausages as we find them quite hard to come by in Sydney. The chorizo had a nice snap to it but needed a bit more spice. The scrambled eggs were sprinkled with chives (as scrambled eggs should be!) and cooked through but still moist – perfect. The accompanying onion jam was very sweet and worked well to add some more flavour to the eggs. Again, a filling and tasty serving especially since there was more hot sourdough toast on the side. The muffin ($8) and croissant varieties change daily. Other offers on this day were plain, almond or chocolate croissants and pear and pecan muffins. 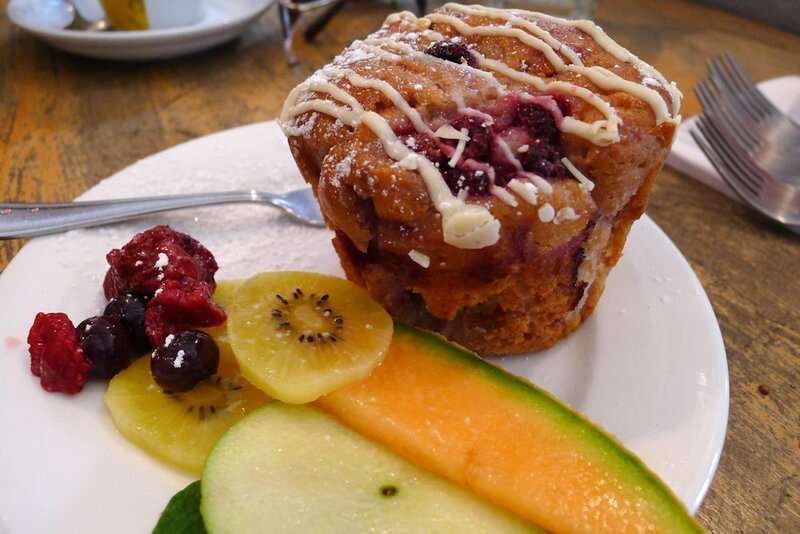 We shared a raspberry and white chocolate muffin which had plenty of berries and was topped with a chocolate drizzle. Overall very well presented but we have tasted better muffin bases. Lemon Café boasts a fun, sunny environment with friendly staff and large, well presented, unique and delicious dishes. There was enough variety to encourage us to go back including offerings such as ricotta pancakes (topped with fresh strawberries, banana and real maple syrup, $13.50), omelettes (prosciutto, cherry tomatoes, rocket & goats cheese, chorizo, potato, Spanish onion & kalamata olives, mushroom, spinach & ricotta or grilled eggplant, fresh tomato, basil and buffalo mozarella, $13.90 each) or prosciutto breakfast (poached eggs with prosciutto and wilted spinach on an English muffin topped with a light Napoli sauce, $15.50). This entry was posted in Sydney - Inner East and tagged Dog friendly, Outdoor seating. Bookmark the permalink.